Can anyone help me identify this component? It just says 0 or D on it (I think it's a zero). I tested it for conductivity with a multimeter - doesn't seem to have any (tried both polarities in case it's a diode). Tested for resistance: nothing (i.e. infinite resistance), although I'm not 100% sure I was touching the contact points correctly, so don't take this as an ultimate measurement. Thanks in advance! This is a 0 Ohm resistor. Probably in 0805 package. If the multimeter shows infinity (open circuit), or any significant resistance > 0, when measuring the element's resistance it means that it is damaged. 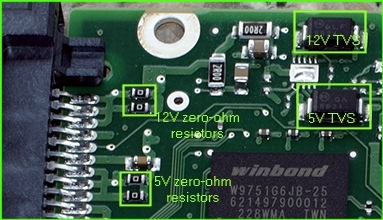 The multimeter should show zero resistance when measuring such "resistor". On the PCB you can replace it with a solder blob or a piece of wire. That is an 0 Ohm Resistance. they also called SMD jumper resistors. They are used as wire links to connect the traces on Surface mount boards, which can be assembled using pick and place machines easily. (same like jumper wires in through holes boards). It is an SMD resistor. As stated in the comments, the number indicates its resistance value; namely 0. You mentioned you couldn't measure any resistance across it. Are you sure it's not coated? Be careful using a solder blob or too heavy a gauge of wire you might blow other components in the circuit. An analogy: Your car has blown a 5A fuse and your radio stops working, well you check and you don't have any 5A fuses on hand. So.... you substitute a 10A fuse instead, you could cause damage to the radio or whatever shares that circuit because too much current flowing through the 10A fuse. Better check to see if deices in that circuit could have caused to infinity reading in the 0 ohm resistor. Not the answer you're looking for? Browse other questions tagged identification components or ask your own question. 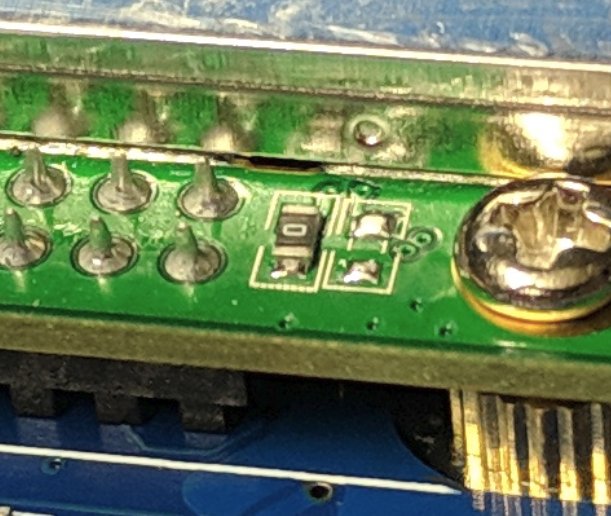 How to identify this particular SMD component? what is the component with the circle mark? Please help with Identifying my diode?